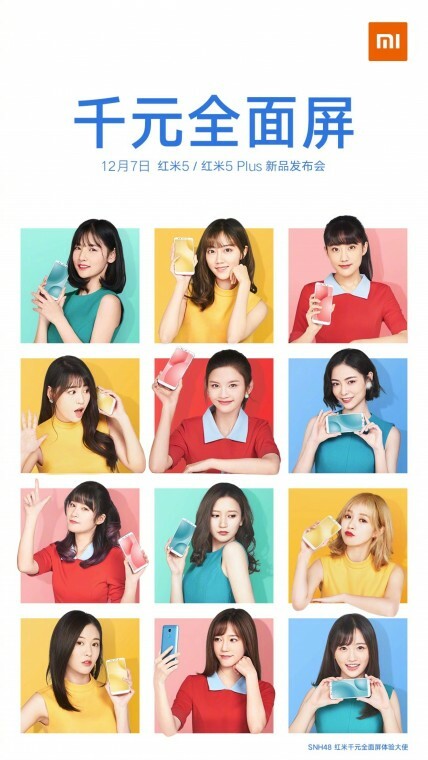 Official launch date for Xiaomi Redmi 5. The phone has been subjected to some leaks, including the one we saw early today which was revealed by press renders. Now we can confirmed that come December 7, Xiaomi will be launching the redmi 5 and redmi 5 Plus. The news came from the manufacturer through its official Weibo account. The phone will be introduced by the twelve members of the pop band SNH48. From the image which the company released, the phone will be debuting with a full view display. At the back, there will only be a single camera shooter with identification scanner. The photo came with a tag, which says A phone for a thousand”, meaning the redmi 5 is likely to cost about CYN 1,000 which is about 150$. It might interest you to know that the predecessor Redmi 4x is still on sale in China with a price tag of 800 CYN (90$).